I drove up to Aiea State Park to see where Hawaiian forestry and herbal medicine intersect and to see stunning views of Kane’ohe Bay and windward O’ahu. Clouds covered much of the mauka parts of the island as I entered Aiea State park where Keaiwa Heiau is located. The heiau is a place of healing where kahuna lapa’au or herbal doctors treat a range of ailments using medicinal plants cultivated at the heiau and that grow in the surrounding forests. 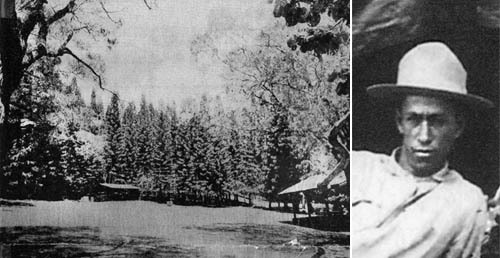 During my research for the centennial of the Hawaiian Trail and Mountain Club, I learned that Keaiwa Heiau was a special place to Tom McGuire, an HTMC legend — one of the two Tom’s credited with the discovery of the TomTom Trail — an old Hawaiian Trail between Kamiloiki and Waimanalo — in 1922. Tom McGuire was a kahuna lapa’au who spent considerable time at the heiau. Tom McGuire was a also forester with the Territory of Hawaii. 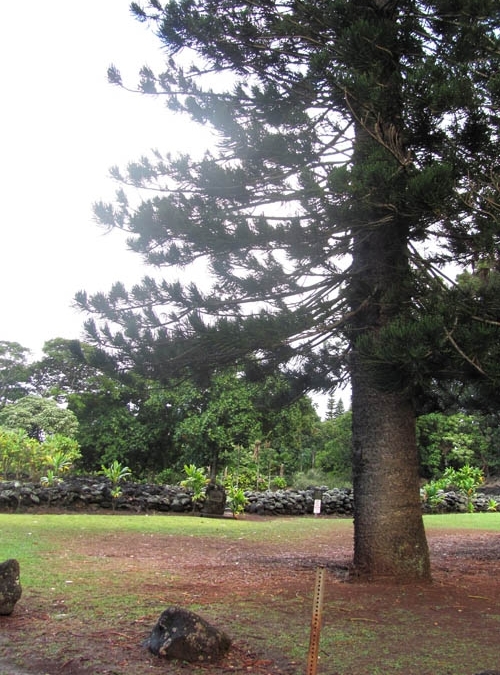 In 1928 he planted a grove of norfolk pine (Araucaria heterophylla) trees next to the heiau. After parking my car and pushing off on the Aiea Loop Trail I hiked through a grove of swamp mahogany (Eucalyptus robusta) trees. 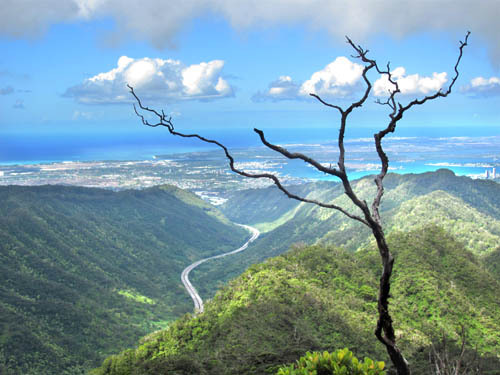 Within 100 years following Western contact in 1778, many areas on Oahu were deforested by cattle that roamed the mountains and destroyed the native forests. By 1903, water supplies dwindled so alarmingly that the sugar industry directed the Territory of Hawaii to create a Board of Commissioners for Agriculture and Forestry to reverse the situation. During the first half of the 20th century, millions of fast growing trees from all over the world were planted to restore the watershed. The effort proved largely successful as the forests brought back the rain and the islands were saved from desertification. At the same time however, some of the non-natives trees that were brought in were invasive — like the strawberry guava (Psidium cattleianum) trees that thrive along the Aiea Loop Trail — and have over-run many native forests. 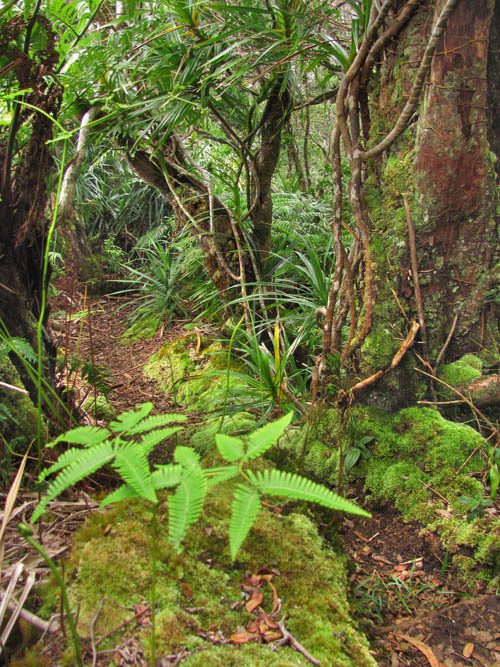 Today, much of the forest along the Aiea Loop Trail is a mixture of native and introduced vegetation. 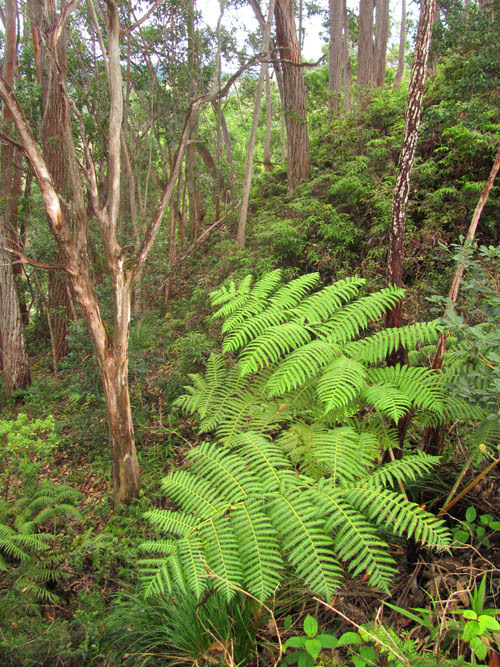 Native uluhe (Dicranopteris linearis) and hapuu (Cibotium chamssoi) ferns grow in the understory beneath a grove of flooded gum (Eucalyptus grandis) trees. 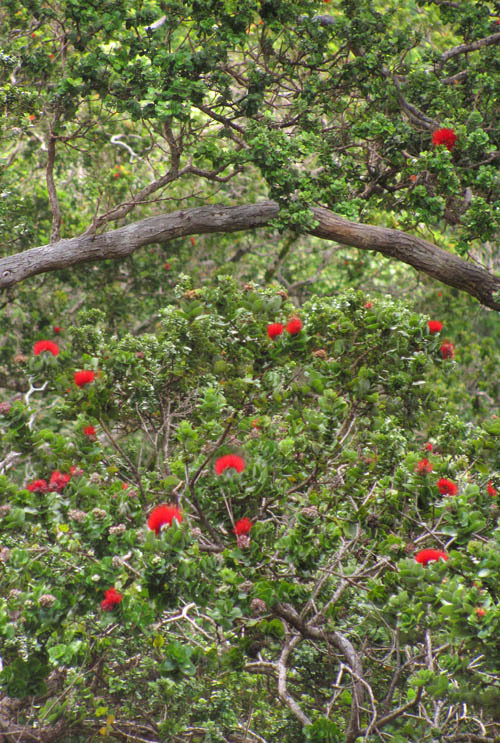 The vegetation becomes much more native on the Aiea Ridge Trail, where many ohia lehua trees (Metrosideros polymorpha) with vibrant red flowers thrive at the junction with the Aiea Loop Trail. 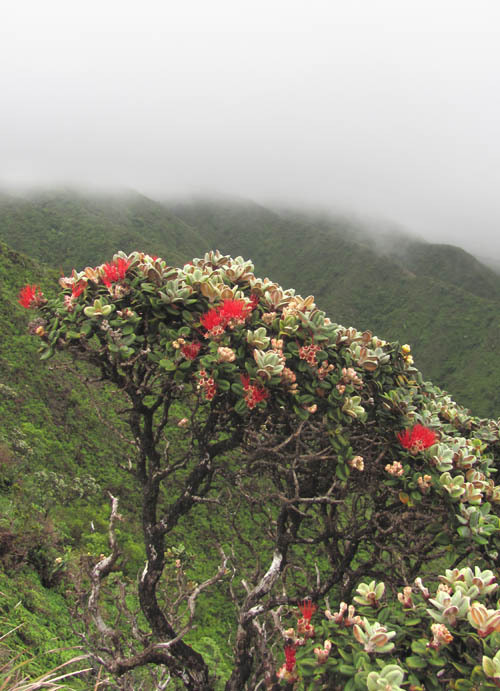 In ancient times, lehua flowers were used as a medicine for women in childbirth. 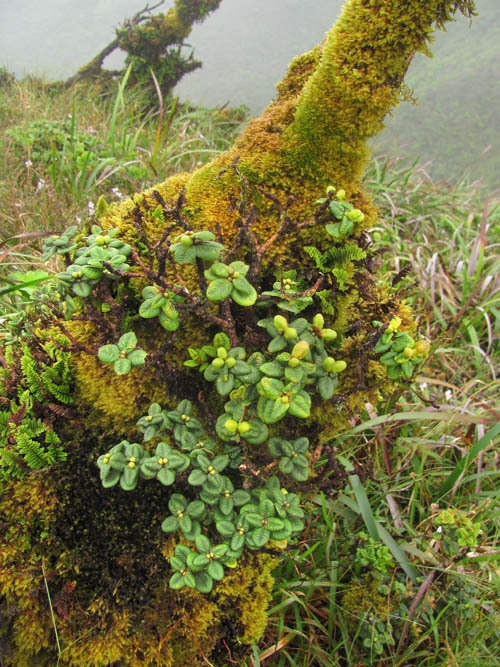 Ohia are the dominant tree in the native forest, but they are slow growing — only a few inches per year — and it takes many years before they produce their first flowers. 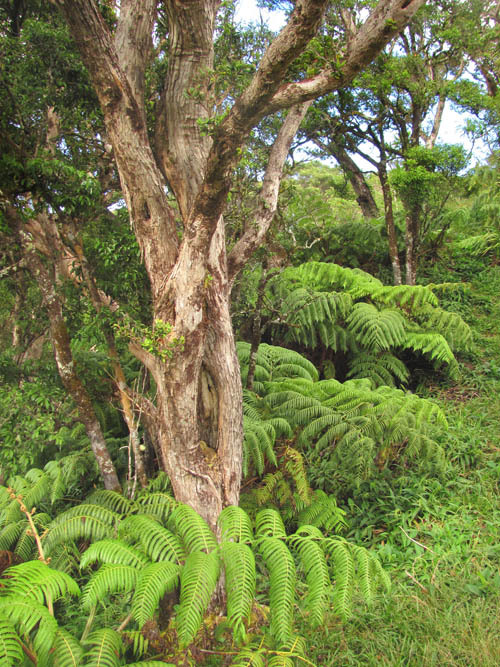 Growing in the understory beneath ohia lehua trees are shade-loving hapuu ferns. 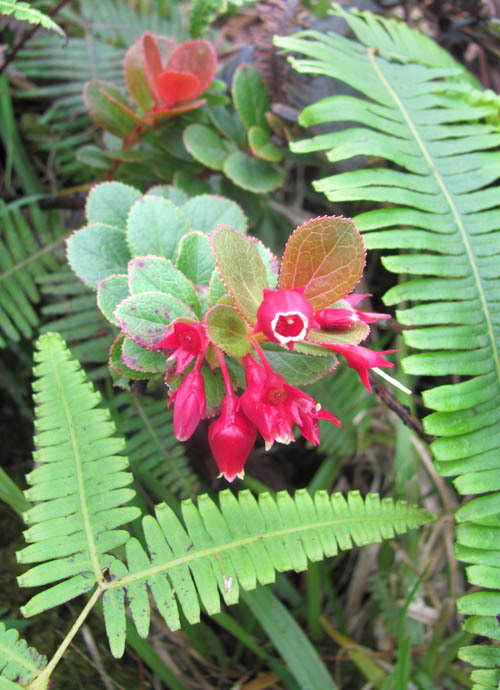 Prior to Western contact hapuu was used as a “blood purifier” and for restoring loss of appetite. 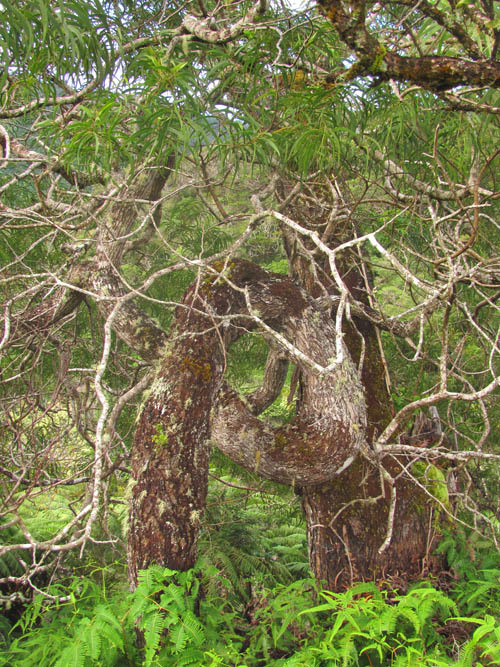 Koa trees (Acacia koa) are the next most common tree in the native forest. 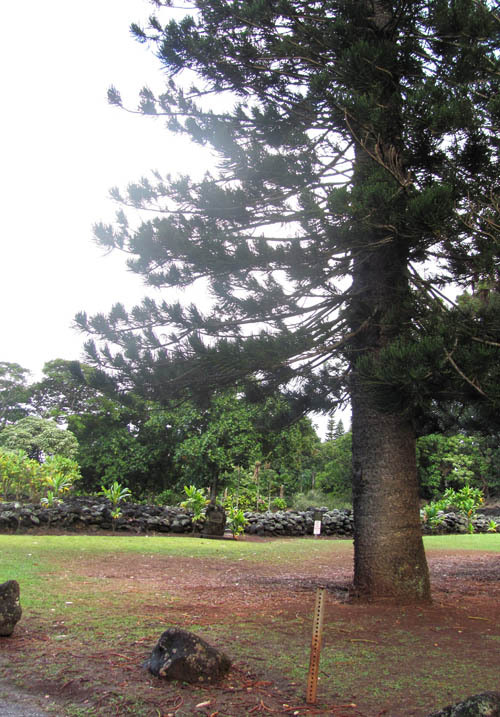 Aiea Ridge is one of few places on O’ahu where koa trees reach several feet in diameter. Kahuna lapa’au would use the young leaves of koa used to induce sleep for cramps or fevers. The first mile or so of the Aiea Ridge Trail are where the native trees reach their largest size on the trail — some of them reaching 40 feet into the air. Some of the thick 2-1/2 foot diameter koa trees act as nurseries for other plants. 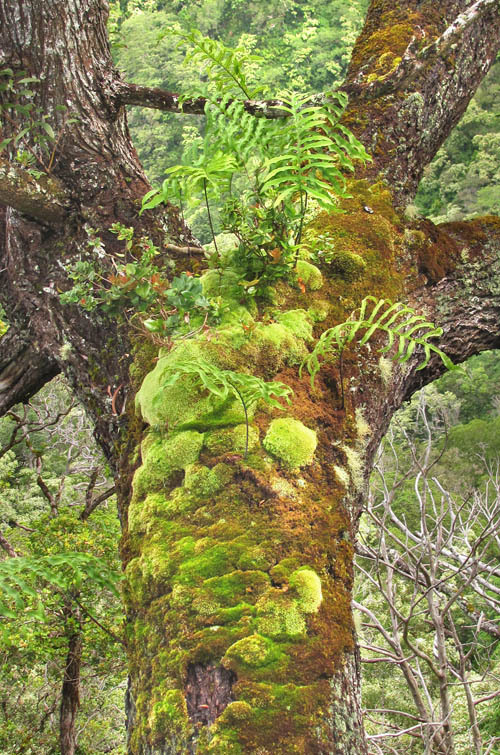 The crook of the tree is home to a community of mosses, ohia trees, and lauae ferns. Further along the trail is another native tree — ohia ha (Syzygium sandwicensis) — the native mountain apple, with an impressive trunk 2 feet in diameter. 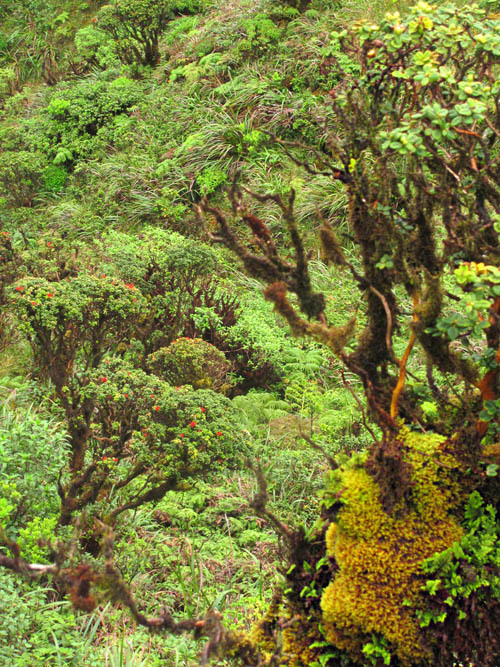 Prior to Western contact the leaves of ohia ha were brewed into a tea to lift the spirits. While clouds covered the interior of the island, the coasts were bright and sunny. 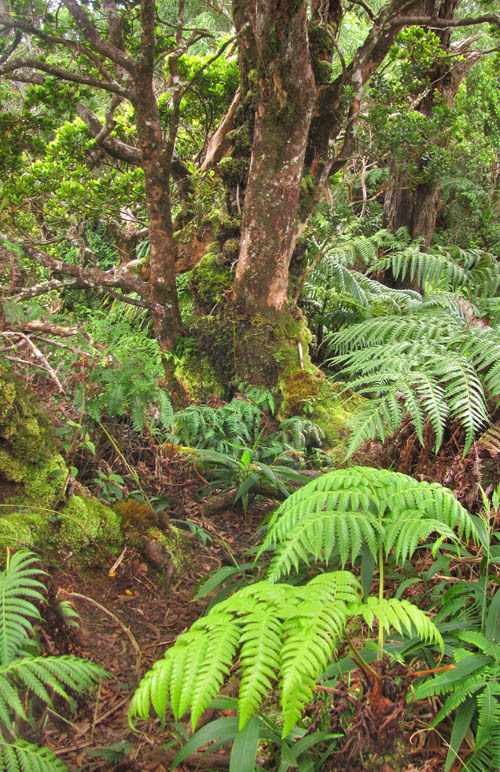 After crossing over to an adjacent ridge further away from Halawa Valley and H-3, the trees decrease considerably in size and stature — most of them beneath 12 feet tall. While clouds shrouded the Koolau Summit Ridge, they were not very thick. The clouds blew in waves with alternating periods without clouds. Since I wanted to photograph the magnificent views at the top, I attempted to time my ascent to a lull between the clouds. The vegetation becomes windswept and lower to the ground near the summit with few shrubs taller than 4 feet high. I saw many bright red ohelo flowers as I made by way up the trail. The early Hawaiians used the leaf buds, leaves and fruit of ohelo to treat stomach pains. When I reached the electrical tower near the top, I saw 6 foot high lehua papa trees (Metrosiders rugosa) covered with moss. Since clouds still shrouded the Koolau Summit, I took my time exploring the moss covered trees along the way. 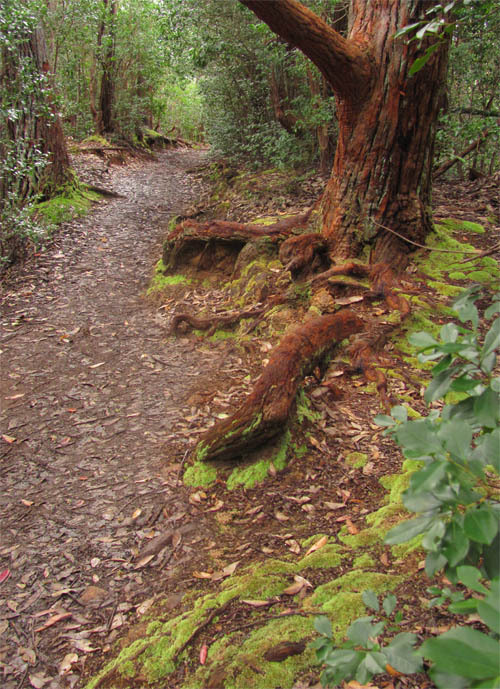 Mosses greatly increase the surface area of a tree and permits more moisture from passing clouds to condense, drip down tree branches, and follow tree roots into the earth where the water begins its journey to join the ground water in the aquifer. 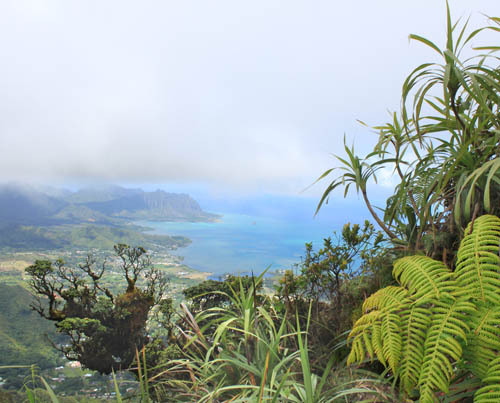 As the last remnants of the clouds blew over and dissipated, I reached the summit and was treated to fantastic views of Kaneohe Bay and the Koolaupoko coast of windward O’ahu! The leaves of lapalapa trees (Cheirodendron platyphyllum) fluttered in the tradewinds that swept over the Koolau Summit Ridge. The early Hawaiians combined the tap root of lapalapa in an herbal preparation to treat a loss in desire to drink water. After photographing the spectacular view, I turned right to hike about three-quarters of a mile to the south along the spine of the Koolau Summit Ridge. Clouds blew in periodically and blocked all windward views as I climbed up and down the humps along the spine for about 45 minutes. 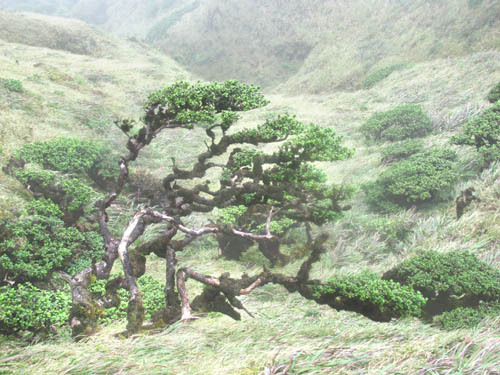 I saw this dramatically wind-blown lehua papa tree along a stretch of the summit ridge where the wind had been channeled. The purpose of my hike further along the Koolau Summit Ridge was to see whether the haha (Cyanea stjohnii) we had seen during our Halawa-Aiea crossover three months ago was in bloom. 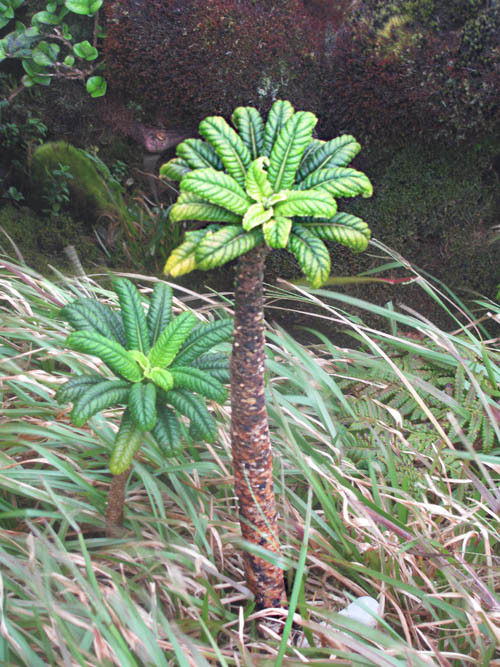 Cyanea stjohnii is extremely rare and is on the federal list of endangered species. Unfortunately, I was too late — the flowers had already come and gone — and only their spent calyxes remained on the plant. 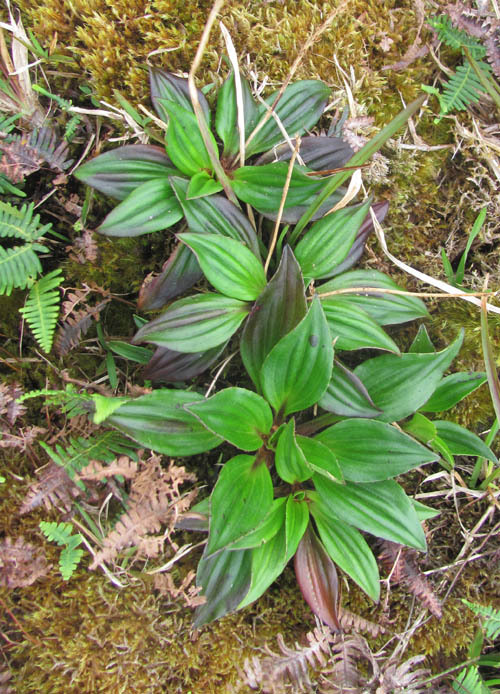 Fortunately my travail along the Koolau Summit Ridge was not wasted — I saw another endangered plant — laukahi kuahiwi (Plantago princeps) nearby along the spine of the Koolau Summit Ridge. 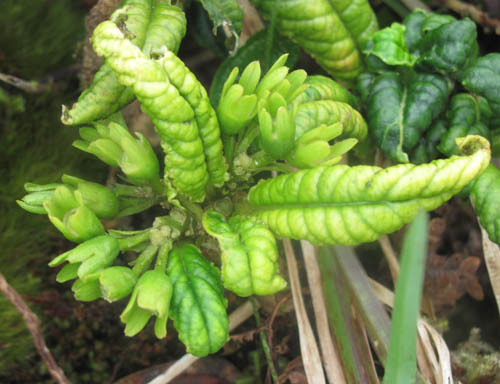 Kahuna lapa’au used the leaves of laukahi kuahiwi as a laxative and as a treatment for swollen boils or sores. Since it was getting late in the afternoon, it was time to turn around and return the way I had come. As I climbed up and down the Koolau spine, waves of clouds blew in several times more. 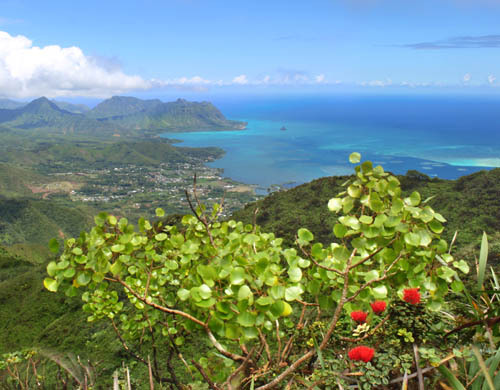 When I reached Aiea Ridge, I turned off the spine of the Koolau to make my way down Aiea Ridge Trail back to the park. While making the return leg of my hike, I reflected on the magnificent trees I had seen, the fascinating medicinal plants used by the Hawaiians, and how fortunate we were to have escaped environmental degradation almost one hundred years ago due in large part to the work of Tom McGuire and the forestry movement. What a great hike! Thanks for posting not only the terrific photos, but also the decription and uses of the native plants. HOw far is the summit from Aeia Loop junction? How much time did it take you? It’s pretty far — I would estimate 5 miles each way. It takes me about 3 hours to get to the summit.